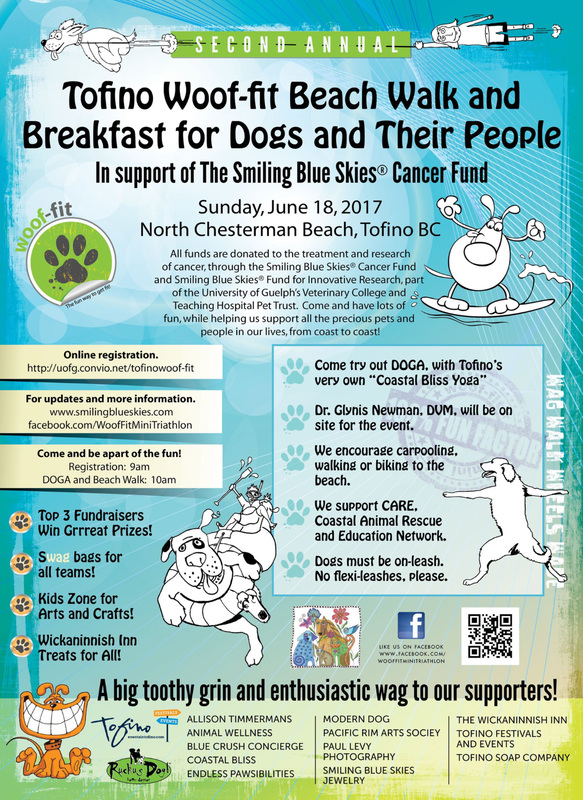 The Second Annual “Woof-fit Tofino” for Dogs and Their People, will take place on June 18th, 2017, on spectacular North Chesterman Beach, in beautiful Tofino, British Columbia. Come join us for a terrific session of DOGA, thanks to “Coastal Bliss Yoga’s” Laura Heininger, and then we are off for a beautiful walk, topped off with an amazing breakfast, prepared by the kitchen brigade of “The Wickaninnish Inn." Since the spring of 2001, The Smiling Blue Skies ® Cancer Fund has been supporting OVC Pet Trust’s quest to find more and and better ways to deal with the devastating disease that is cancer, and together, we have raised nearly $1.8 million!! 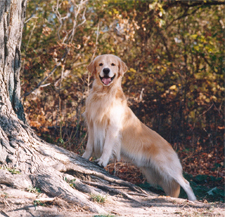 Right now, you are helping to fund EIGHT canine oncology studies and SIX oncology-related studies, including: Evaluation of the safety and effectiveness of standard-of-care therapy, with or without adjuvant rapamycin administration in dogs with osteosarcoma; Non-invasive detection and quantification of circulating tumour cells in dogs with appendicular osteosarcoma; Identification of response to chemotherapy in relapsed canine lymphoma patients; Evaluation of sentinel lymph nodes in dogs with oral tumours; Analysis of cytokines in dogs with osteosarcoma treated with amputation, radiation and/or chemotherapy; MicroRNA profiling for diagnosis and prognosis in canine multi-centric lymphoma; Prognostication of canine T-cell lymphoma; and an acute myeloid leukemia study. You are also supporting the Clinical Trials Coordinator position at OVC. Because of this work, we are able to keep front line specialists and referring veterinarians informed with the latest information about new and ongoing cancer studies, and continually improve communication, outreach and awareness, always focusing on finding solutions to cancer. You also helped fund the very first Hemangiosarcoma Validation Study and North America’s first Cancer Registry for Companion Animals. To top it off, the Companion Animal Tumour Sample Bank successfully registered with British Columbia’s Biobank Resource Centre: Canadian Tissue Repository Network. This takes our work beyond our borders to the international level! Smiling Blue Skies offers 24/7 support to anyone whose life has been touched by cancer. It does not matter where you live! Thank you to all the heroes out there, whether all grown up or “reaching tall,” all giants in our eyes, who are helping to take a bite out of cancer on behalf of the precious pets and people in our lives. Come celebrate the human animal bond with us! There will be something for everyone, including a “Kids Zone!” We have an exciting art project planned! Registration will begin at 9:00 a.m., and activities will begin at 10:00 a.m.
Long live blue skies, where hope is a kite and dreams really do come true.